While I'm on the road this week, Maulina has generously offered to take over the reins. Take it away, Maulina! Man #1: What's on your iPod? A while ago I complained that Piano Man, a nameless virtuoso mental patient, was receiving widespread media coverage principally because the media like to depict classical musicians as freaks. 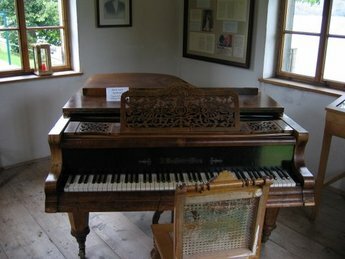 Now it turns out that Piano Man may not be much of a pianist: "Other reports have surfaced that the patient did not, in fact, give a virtuoso piano performance, but, the Mirror said, tapped at one note repeatedly. The hospital disputes this claim." Har. For more on deviant pianists, visit Adam Baer. Update: John Burke proposes a solution to the mystery — Piano Man is in fact a piano tuner. The New Yorker, August 29, 2005. A decade ago, the Mostly Mozart Festival, Lincoln Center’s venerable summertime series, was offering some of the dullest concerts in the Western Hemisphere. I remember a performance of Mozart’s Flute Concerto in D, with Jean-Pierre Rampal as the soloist and Gerard Schwarz conducting the Mostly Mozart Festival Orchestra, which was positively bureaucratic in its self-satisfied mediocrity, as if it were being piped in from a department of motor vehicles in Leonid Brezhnev’s Russia. I briefly considered abandoning music criticism for cat-sitting. In the mid-nineteen-nineties, with the advent of the multidisciplinary, hipper-than-thou Lincoln Center Festival, many people assumed that the older series would fall by the wayside. Instead, Mostly Mozart has undergone a mildly shocking rejuvenation. The programming now includes period-instrument ensembles, dance (the Mark Morris Dance Group performed its masterpiece “L’Allegro, il Penseroso ed il Moderato” last week), even world music (Kayhan Kalhor, the kamancheh virtuoso, appeared last summer). Late-night concerts have been added, and a new stage has been installed at Avery Fisher Hall. The orchestra, which draws on New York’s inexhaustible supply of skilled freelancers, hasn’t changed all that much; half the musicians on the roster were in the group a decade ago. But they’re now playing with a youthful edge, finding threads of novelty in some of the world’s most familiar music. The guiding spirit of Mostly Mozart 2.0 is Jane Moss, the Vice President for Programming at Lincoln Center, who conceived the idea of remaking the venerable summer festival. Working alongside her is Louis Langrée, who took over from Schwarz as music director in 2002, having made his name at the Glyndebourne Festival. An amiable-looking fellow with tousled hair, Langrée conducts in a collarless white tunic, which makes him look something like a celebrity chef. His style is at once warm and sharp; he is plainly liked by the players, yet he is able to steer them out of the eddies of harmonious routine. He has a neat way of etching the beginnings and ends of phrases, so that Mozart’s heavenly paragraphs don’t devolve into dulcet murmuring. In the first movement of the “Haffner” Symphony, for example, a pattering eighth-note figure at the end of a measure is given a marked articulation, so that it drives into the next bar with a kind of piston action. In the same movement, upward scales in the strings are dramatized with quick, flaring crescendos. All through the scores, decorative details become pulses of energy, flexings of musical muscle. At the same time, Langrée avoids the bad habit of incessantly poking at the music as if it were almost dead. The theme of this summer’s festival—it ends on August 27th, with the Mass in C Minor—is “Travelling with Mozart.” We follow the composer on various revenue-generating trips to Paris, Prague, and London; we sample music from each country and hear Mozart’s works interpreted by native ensembles and soloists. At times, the attempt to keep the governing theme afloat results in awkward intellectual calisthenics. When the Gabrieli Consort of London, under the direction of Paul McCreesh, played Mozart’s great G-Minor Symphony, the program annotator ventured that the work was somehow English in nature. I’d have guessed we were in Italy; the performance was winningly fleet and graceful, devoid of the Romantic histrionics that conductors sometimes bring to this piece. 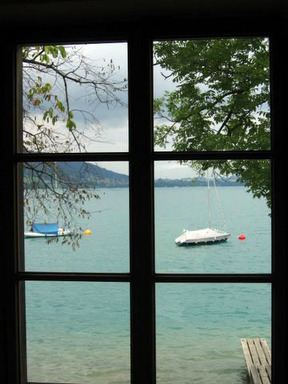 Mozart was, in fact, music’s perfect cosmopolitan: wherever he went, there he was. The festival also wants to shake up conventional patterns of programming, in an effort to simulate the wildly varied concerts of Mozart’s time. In the opening weeks, concert and opera arias enlivened the usual procession of overture, concerto, and symphony, and a handsome parade of sopranos delivered them. Renée Fleming, who sang at the opening-night gala, gave evidence of having headlined one gala too many: she rendered a group of Handel arias in an unintelligible, mannered style. The diva-in-chief was followed by a posse of younger women who were determined to make an impression. Emma Bell sang Mozart’s “Ah, lo previdi . . . Ah, t’in-vola agl’occhi miei” with gleaming intonation and a buoyant personality; the aria is a howl of fury, but Bell had fun with it. Sally Matthews gave dramatic heft to “Ch’io mi scordi di te . . . Non temer, amato bene.” And Erin Wall, a young Canadian, sang “Bella mia fiamma . . . Resta, o cara” with grace and fire, showing the sort of righteous rage that would make for a great Donna Anna. I hope someone from the Met was taking notes. Since Avery Fisher Hall opened, in 1962, various wizards have tried to fix the erratic acoustics and consuming blandness of the place. The prime innovation of this summer’s Mostly Mozart Festival has been to put in place a temporary “Mozart stage,” which goes some way toward humanizing the room. If the New York Philharmonic is smart, it will bring back the new arrangement. The musicians now play on a Brazilian bloodwood platform that extends thirty feet into the audience. There is extra seating to the side and in back of the ensemble. The sound isn’t quite voluptuous, but it’s fuller and richer than it was before: an array of overhead baffles helps to bring focus. If you sit in the “courtside” areas, you are practically inside the orchestra. You get to see the body language of the musicians: a congratulatory nudge to a violinist who has finessed a broken string; a sympathetic pat on the knee to an oboist whose reed starts squawking in the summer heat; Langrée’s inviting glances and grateful smiles. You also notice that the triangle is incredibly loud for its size. The late-night concerts take place in the Kaplan Penthouse, ten floors above Lincoln Center Plaza. A space usually reserved for institutional powwows has been transformed (if you squint a little) into a classical Rainbow Room, with candles on the tables and appropriate beverages. One night, the gifted young pianist Jeremy Denk accompanied Emma Bell in Mozart and Debussy songs, and also played Bach’s Third English Suite. He’s a powerful, intelligent musician, as severe in Bach as he is sensuous in Debussy. He is also a blogger, of all things. (His site, jeremydenk.blogspot.com, contains a soaring description of Messiaen’s “Quartet for the End of Time.”) A few nights later, Jean-Yves Thibaudet rode the elevator up to the Penthouse to give a mini-recital of Satie’s first “Gymnopédie” and Debussy’s Second Book of Préludes. Although Thibaudet’s Debussy is a bit strict and dry for my taste, his musicianship is impeccable, and he has an easy, charming way of talking to the audience. When it came to the encore, he actually took requests: Chopin won over Ravel. The Mostly Mozart team must have wondered whether people would really venture into the wilds of the Upper West Side at 10:30 P.M. No problem: both late-night concerts that I attended were standing-room-only. And the audience was noticeably younger than the one that showed up at Avery Fisher. Eight o’clock, the inviolable starting time for classical events, is, for a lot of us, an awkward hour; we’d rather be sitting down to dinner, not digesting. Younger people also reportedly shy away from the concerts because they are afraid of violating grandmotherly rules of decorum. The Mostly Mozart late-night series, casually serious in tone, raises the possibility that a large institution can carve out alternative identities, rather than try to please several demographics all at once. Most concerts in big halls are two-dimensional experiences. The orchestra is so far away that it may as well be a projection on a screen; the sound has depth, but the image is flat. Change the perspective and the music changes, too. Last spring, I happened to sit in Row A, right in front of the orchestra, for a performance of “Tosca” at the Met. I could see the sweat on Aprile Millo’s brow as she calculated each step into diva madness. Zeffirelli’s grandiose sets soared on all sides, Roman grandeur incarnate. One gentleman in the brass section read a New York weekly while he waited for Scarpia’s ominous sonorities to arrive. The man beside me whispered to his neighbor about the time he saw Callas; the prompter muttered the tenor’s lines. I’ve never had more fun at the opera. Radiohead is/are blogging. Via Thomas. Two leftover scraps from my piece on the luminously strange operas of Franz Schreker. 1) Not one of Schreker's operas has ever been performed in the United States, according to scholar Christopher Hailey. It would be a fine thing if an adventurous opera company — Santa Fe? St. Louis? — took them up. [A reader adds that James Conlon, who has great sympathy for forgotten 20th-century composers, could do them at the LA Opera.] 2) I wanted to write a brief description of Schreker's famous "shimmering" effects, but couldn't shoe-horn it into the piece. In the opening page of the Gezeichneten Prelude, the harmony oscillates between D major and B-flat minor, and what's really interesting is that this alternation takes place in separate layers, at different rates of speed. In the first layer, piano and harps spell out the two triads in swirling triplet arpeggios. In the second layer, celesta and second violins play in the same rhythm, but they change chords with every triplet sixteenth note, producing intermittent dissonances. The first violins, meanwhile, snake around in sinuous patterns, while bass clarinet, violas, and cellos present Alviano's yearning, ambiguous theme. It's one of the most bewitching soundscapes ever devised. Photo from the Schreker Foundation. The "What about Schreker?" story was told to me by David Denby. This recording is a good introduction, though not ideal. CDs and a DVD of the Salzburg Gezeichneten may be forthcoming. I was trying to capture a screen image from the DVD of Peter Sellars' breathtaking Glyndebourne production of Handel's Theodora when a slightly alarming visual composition appeared on my camera: Lorraine Hunt Lieberson, rising wraith-like over the prostrate Dawn Upshaw, in the middle of my living room. The news that the great Lorraine — whose singing in Theodora might be the most astonishing achievement of her astonishing career — has withdrawn from the premiere performances of John Adams' Doctor Atomic, in San Francisco, has occasioned wailings of lamentation in some quarters. But Kristine Jepson, who sang excellently in Rosenkavalier at the Met this spring, should have the voice and acting chops for the role of Kitty Oppenheimer. Doctor Atomic opens on October 1, and runs until the 22nd — ten performances in all. The libretto, as Adams and Sellars disclosed at a recent press event here in New York, is taken word for word from published documentation of the hours leading up to the first atomic test in New Mexico. San Diego writer and composer Thomas Larson has sent along a link to his fine essay on Roy Harris' Third Symphony, which appears in a recent issue of the San Diego Reader, alongside various personal accounts of musical passions and discoveries. It's nice to see classical music heavily represented in this anthology; usually, such a piece would include pop and nothing but. Funny final sentence from Mary Grimm: "William Byrd feeds my soul while I feed my kids pancakes." The New Yorker, August 22, 2005. The musicologist Christopher Hailey, who has long campaigned for a Schreker revival, observes that the operas work best if they are done in the highest possible style. The Salzburg performance, despite a series of awkward cuts, came close to the ideal. Kent Nagano conducted the Deutsches Symphonie-Orchester of Berlin, applying the same priestly devotion to Schreker that he brings to Mahler and Messiaen. Robert Brubaker sang the taxing role of Alviano with unflagging intensity, perhaps missing some lyric nuance along the way. Michael Volle was a charismatic and brutal Tamare. Above all, Anne Schwanewilms was transfixing as Carlotta. With her hotly expressive stage presence and coolly beautiful soprano voice, she caught the ambiguities of Carlotta's character and, by extension, all the fire and ice of Schreker's world. 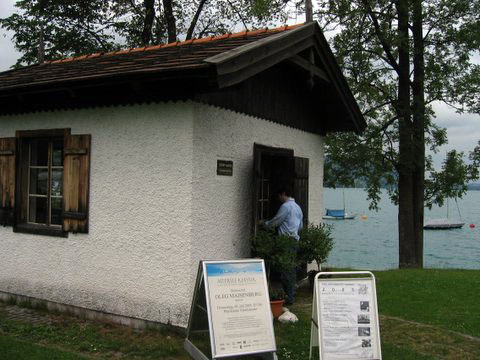 During my recent trip to Salzburg, I went out to the tiny town of Steinbach, in the spectacular lake-and-mountain region of Salzkammergut, to see Gustav Mahler's composing hut. There are, in fact, three Mahler composing huts — in Steinbach, Maiernigg (to the south, on the Wörthersee), and Toblach (now Dobbiaco, in Italy). This is the one where the big man wrote much of his Second Symphony and drafted his Third. 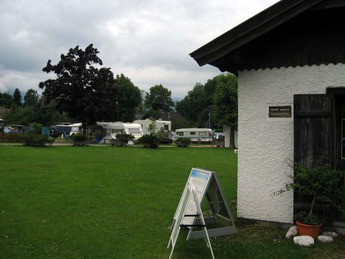 He built it to escape ambient noise at the Gasthof zum Höllengebirge, which is now the Gasthof Föttinger. 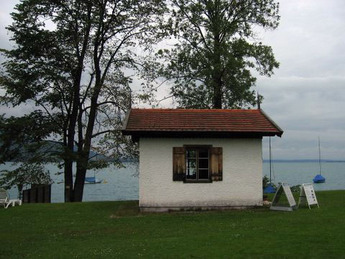 Mahler's unquiet ghost is no doubt upset by the fact that his idyllic lakeside retreat is surrounded by an RV site and campground, where kids squeal all day long and German rap pumps from boomboxes. From Bruno Walter's memoir of Mahler: "I arrived by steamer on a glorious July day; Mahler was there on the jetty to meet me, and despite my protests, insisted on carrying my bag until he was relieved by a porter. As on our way to his house I looked up to the Höllengebirge, whose sheer cliffs made a grim background to the charming landscape, he said: 'You don't need to look — I have composed all this away!" 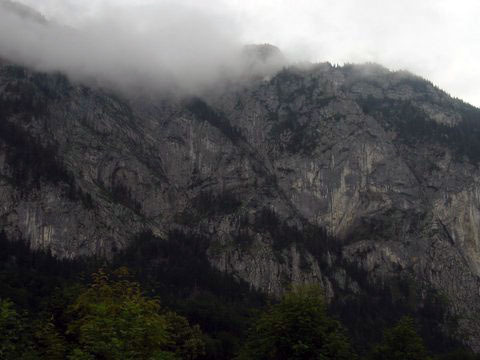 The rockface became the introductory theme of the Third Symphony, the unison chant for eight horns, which he dubbed in one sketch "What the rocky mountain tells me." Accompanying me on the expedition was Jeremy Eichler, critic at the New York Times, whose own report on the Salzburg Festival can be read in Sunday's paper. We picked up the key to the hut from the Gasthof reception desk. Turning the key in the lock seemed to trigger a switch; the Third Symphony started blaring when we walked in. Inside the hut is the piano on which Mahler composed, or a replica thereof. Photographs and fascimile manuscripts line the walls. There's a guestbook in which pilgrims can record their impressions; one visitor made an evocative sketch of Mahler at work. I was prompted to make the trip to Steinbach after receiving a copy of Calling on the Composer, a new guide to composers' houses and museums by the late musicologist Stanley Sadie and his wife Julie Ann Sadie. Portions of the book had been appearing in Gramophone for several years. Sadie, whose life's work was the massive New Grove Dictionary of Music, finished this book just before his death last March. The last music he heard was the slow movement of Beethoven's final string quartet, Op. 135. 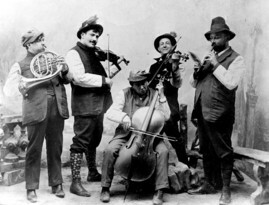 The Chilingirian Quartet, which had just performed in a concert series that the Sadies had organized near their home, played it for him in his bedroom, as he went in and out of consciousness. He died the following day. The usual admonition to "rest in peace" seems unnecessary. When I set up this site last year, one of my first links was to www.schoenberg.at, the website of the Arnold Schoenberg Center in Vienna. You won't find a more comprehensive online documentation of a composer, maybe of any artist in any medium. And the site has continued to grow over the past year. 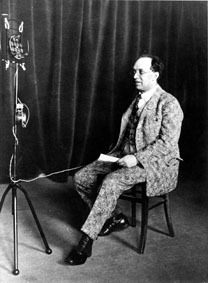 Schoenberg WebRadio, the audio portion, now offers dozens of historical items, including a flavorful recording of Schoenberg conducting the second movement of Mahler's Second Symphony. Schoenberg Jukebox allows you to listen to the composer's entire output. And, for the musicologically inclined, most of Schoenberg's music manuscripts are now available for viewing. Photo: Schoenberg on cello, Choire Sicha playing fiddle. Timothy Noah of Slate catches up with the deepest, darkest secret of the ever-developing Tom DeLay scandal, noted here back in April: the House Majority Leader likes opera.